With vehicle technology becoming more sophisticated each year, it is essential that workshops invest in the right equipment. At Lynchford Service Centre we have the latest Bosch vehicle system management scanner with modules that cover most European and Japanese vehicles.We are also very proud to be one of the only garages to have the Genuine Rover diagnostic system so We are able to carry our a variety of tasks from resetting service indicators to diagnosing complex engine management and Anti Lock Braking faults. Why is specialist diagnostic equipment needed ? Modern vehicles are controlled by numerous sensors and electronic components that are linked to the main computer that controls how the vehicle functions. Occasionally a fault may occur with one of the sensors or with the control unit itself. 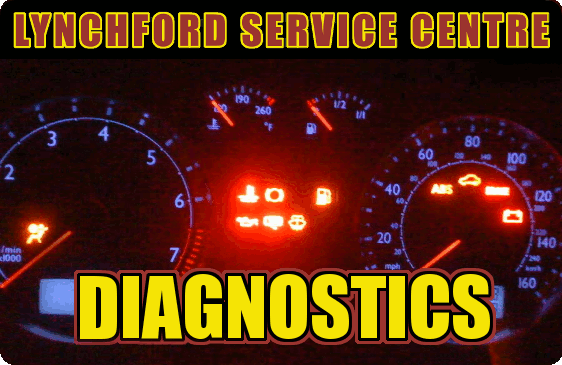 By using our sophisticated diagnostic tools with can trace and identify the cause of the fault and then rectify it. What faults can be diagnosed ? Most system faults will be shown by a warning light on the dashboard indicating that the fault requires investigation.